The Garden House is a spacious wing of a Manor house built in the Georgian style and has achieved English Tourist Board 5 star rating. 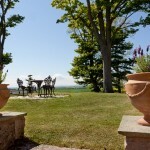 It enjoys panoramic views of the rolling hills and acres of beautiful countryside. 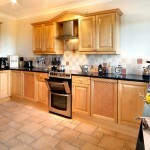 This house provides comfort and elegance of a very high standard at a very reasonable price. Luxury and comfort on tap for any family, group of couples, or a single couple eligible to take advantage of our two person discount (please refer to the price in brackets on our availability chart). The Garden House is entered through double doors into a central hallway. From here, access is to the dining room, kitchen and utility room. Bedroom 1 : Two Beds with luxury pocket sprung mattresses with a zip link to create a super-king size, or twin if required, LED en-suite wet room with a powerful shower and additional electric shower, toilet,wash hand basin and shaver point.The kitchen is equipped to a very high standard with solid maple units, granite worktops and all integrated appliances such as dishwasher, microwave and full sized oven and hob. The dining room has an open fireplace, additional 32” LCD television and a large bay window with double doors leading to the terrace. Settee, CD/ Radio, I-pod docking station. 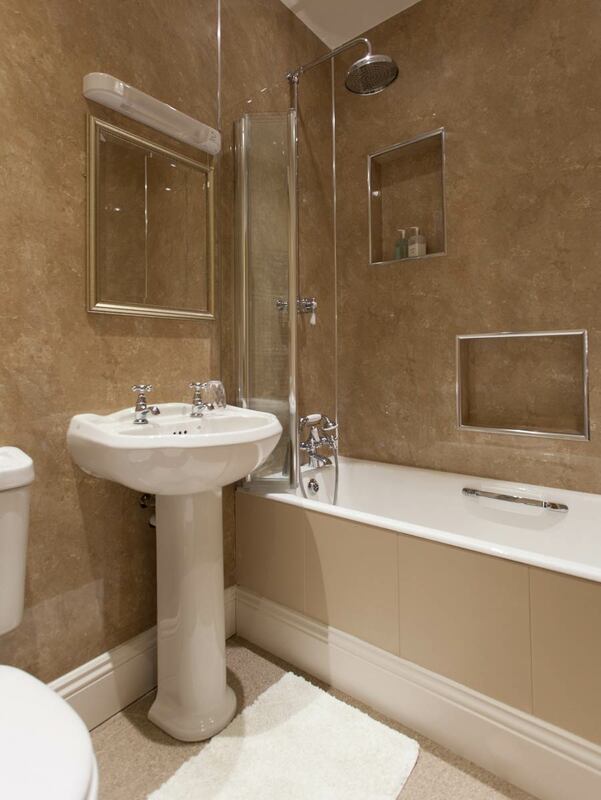 Cloak room : High level toilet, wash hand basin, washing machine and tumble dryer. Two bedrooms Bedroom 2 : Cream painted French double bed with pocket sprung mattress, LED wall mounted TV and en-suite with slipper bath, toilet, wash hand basin and shaver point. 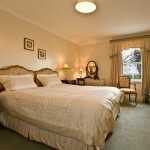 Bedroom 3 : Choice of twin beds with luxury pocket sprung mattress, or a zip link super-king size bed, LED wall mounted TV. 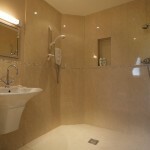 En-suite bathroom with Mira rain shower over bath, toilet, wash hand basin and shaver point. 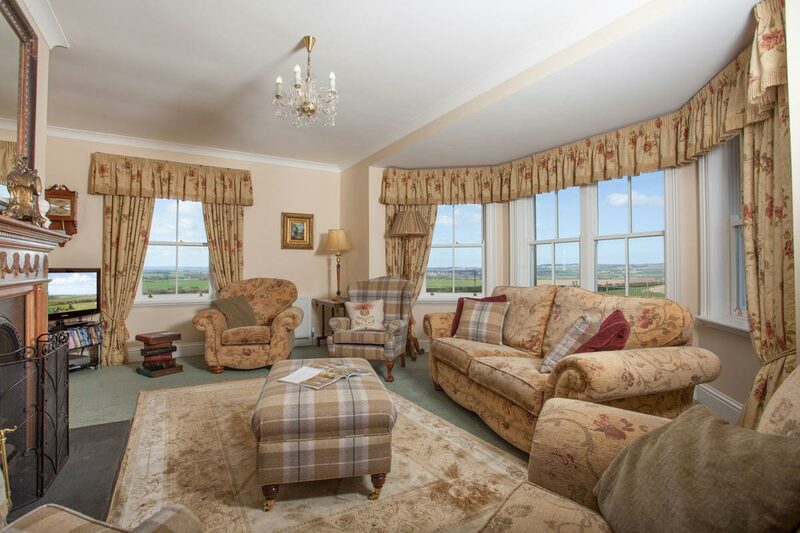 The living room with open fire is on the first floor to take advantage of the breathtaking views from the bay window with 32″LCD TV & DVD. Wi-Fi : Available (own lap-top required). 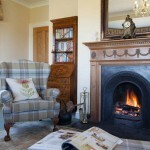 Heating by oil-fired central heating and open fire. Fully double glazed and carpeted throughout. Garden: Children’s swing and see-saw set. For once, words fail me, Robert! This house is “simply the best!” You have thought of everything, and, as usual, “everything” has been fantastic. Very sad to be going home, and looking forward to our next visit already! Boys loved being here. Thanks so much. 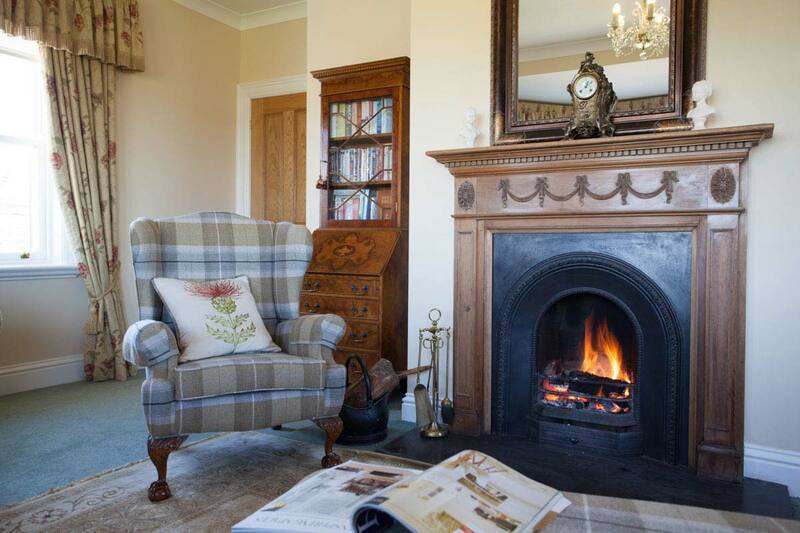 What can you say accommodating neighbour – excellent home, disappointing to leave but in doing so have to say The Garden House was undersold at 5 star – promote to 7 stars – but in all the best accolade is “We will be back”. 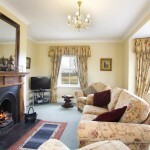 Our best Premier Cottage so far. 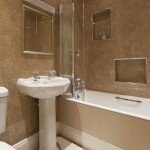 Top quality accommodation and facilities. Really enjoyed my fires! A warm welcome from Robert – great scones! Places to visit – Kelso, St Abbs Head, Bamburgh a must – brilliant beach, Holy Island (check tide times!). Day trips to Edinburgh and Newcastle. Favourite walk – Park at Honey Farm – walk down to Chain Bridge – footpath to Berwick. Food – Cross Inn Paxton (Excellent). 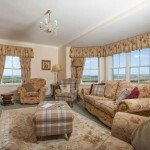 Beal Barn -lovely lunch – great view of Holy Island. Thank-you for providing a fantastic house in such a lovely location. The accommodation is best we have stayed in, and I doubt we will find any better. Robert, thank-you for the wonderful scones and cakes, and making us feel so welcome. Make sure you visit the beach at Bamburgh Castle, and Alnwick Gardens is worth the drive. This has been fantastic holiday, and we are all sad to be going home! Could have done with another week! Will surely return soon. As near perfect as anyone could reasonably expect it to be – thanks Robert for creating The Garden House. We really enjoyed our stay here thank-you. The other guests who recommended places to go and to eat got it spot on so new guests should read back through this book. 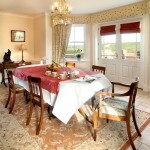 For two person discount refer to Prices and Availability Page where the price is displayed in brackets. 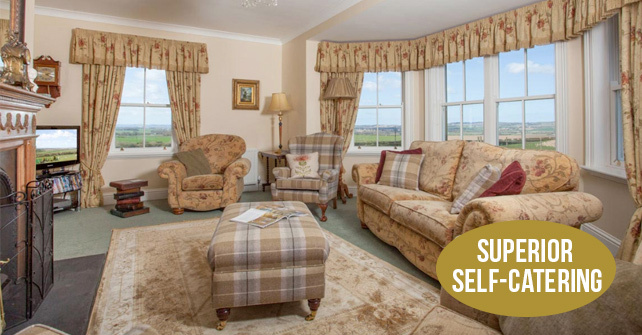 This price will not be shown on the book now system, but will be shown on the receipt e-mail – so please write in the notes box in the on-line form – “I would like to claim the two person discount as per booking T&C’s.